The fat is harvested using a small cannula attached to a syringe. The fat is then either left to settle or put in a centrifuge to spin off the oil layer. The purified fat is then reinjected. The reinjected fat remains permanently. It is a useful technique for filling depressed areas, e.g. cleft lip deformities, Romberg’s disease, deformities after excessive liposuction, or deep skin wrinkles. At present in Australia, the use of fat injections in to native breast tissue is being investigated and is considered an unsafe procedure at the current time. 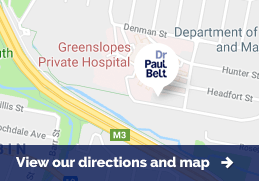 Please contact Dr Belt’s staff on 07-3852 6800 and a personalised quote and further information will be provided. The specific risks are those of over or under correction, migration of the transferred fat, infection and loss of the transferred fat. The placement and harvesting incisions are small and strategically placed so as to be largely concealed in natural skin crease lines. The effects of fat transfer are immediate. There is a degree of swelling which takes some weeks to settle down. Any bruising can be helped with cold packs for a period of up to 48 hours. A useful technique is to use Hyaluronic acid as a temporary filler first. This will give the patient a realistic idea of the degree of correction that can be obtained. This product lasts for 3 - 12 months. Most patients find that the effect is good for an average of nine months. It is also possible to inject sterile physiological saline (salt water) to see an immediate effect which will last approximately 12 hours. This can be a useful guide to see if the desired effect can be achieved. The areas of depression are carefully marked pre operatively. The amount of fat and its precise redistribution is carefully calculated.